The Outer Banks is home to so many wonderful events, and perhaps the most well-known event is the annual Outer Banks Bluegrass Island Festival. Located right on the water at Roanoke Island Festival Park, bluegrass lovers come together every year for a 3-day festival of food, fun, and mountain music by the sea. Kick back on the stunning waterfront festival park with your friends and family and enjoy the sounds of the country’s finest bluegrass performers like Rhonda Vincent & the Rage, Seldom Scene, Joe Mullins & the Radio Ramblers, Nothin’ Fancy and Town Mountain, just to name a few! With dozens of local restaurant and merchandise vendors, you’ll also get to enjoy great food and do some shopping between sets. This year’s festival begins on May 16th and runs through May 19th with a free “kickoff” event held on Wednesday, May 15th at the Bluegrass Island Trading Co. Tickets are now on sale but they do sell out fast so make your travel arrangements as early as possible. 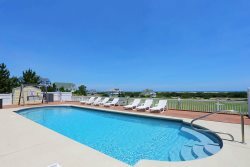 If you still need lodging for the event, our Nags Head Vacation Rentals are not far from the festival park and feature amenities like elevators, private pools, hot tubs, and multiple bedrooms! If you have a smaller party attending the festival, consider one of our oceanfront condos before you book a hotel – not only is it more cost-efficient, but you still get to enjoy all the convenience and amenities of a beach house like an incredible ocean view and a full-sized kitchen. Cost: Early-Bird Prices good through end 1/9/2019. Parking: Free parking through downtown Manteo is very limited. A Park & Shuttle is available at the Fort Raleigh National Historic Site to shuttle you back and forth for the event. Bathroom Facilities: Venue has indoor restrooms toward the back of the park and in the museum building. Portable toilets will also be provided in the festival area. For more information, visit http://www.bluegrassisland.com/.